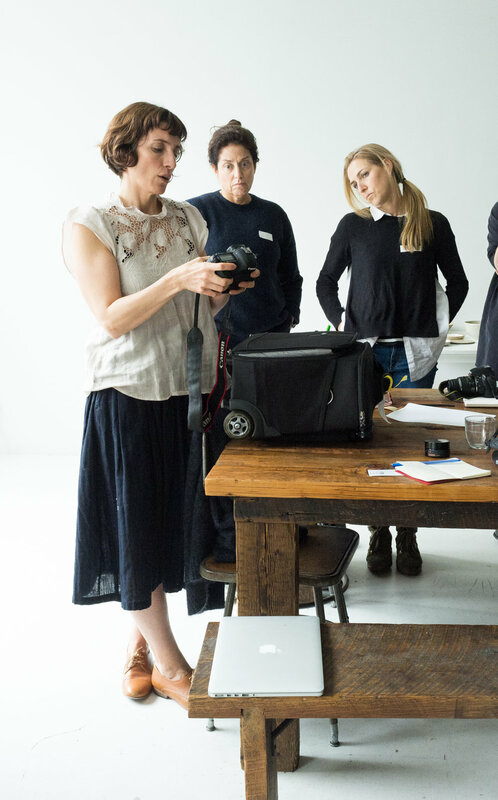 Last Thursday night I hopped on an Amtrak train from Boston to New York City to attend a food photography and styling workshop with Aran Goyoaga of Cannelle et Vanille. I'd been stalking the workshop for quite a while, but decided at the last minute to attend. Luckily, there was one spot available for me to nab the day before the workshop began! 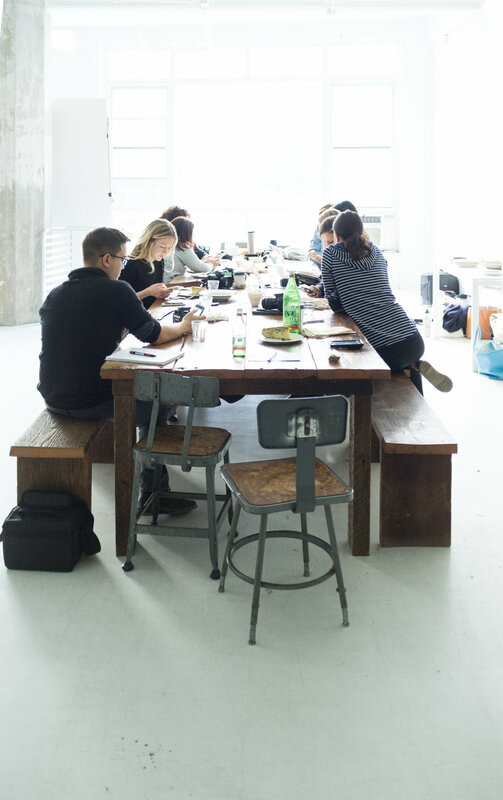 The workshop took place at the dreamy Sunday Suppers studio in Williamsburg in Brooklyn. I've been following the Sunday Suppers Instagram account for a while, so I knew that it was a gorgeous space worth checking out in person. We kicked off the weekend with an optional meet-up at the Union Square Farmers Market on a very rainy Friday morning. Several of us met there with Aran to source some ingredients for the workshop that weekend. Huddled under umbrellas, we followed Aran around from vendor to vendor as she showed us how she sources ingredients to photograph. Aran took her time thoughtfully rooting through crates of pears looking for just the right ones. No detail is too small when it comes to sourcing. How long are the pear stems? Do they curve and look more interesting than ones with shorter stubbier stems? After the market tour we walked over to The City Bakery for coffee and pastries. We sat around with lattes in hand, listening to Aran tell us more about herself, her work, and her camera equipment. This was really informal and casual and the loveliest way to get to know her and some of the other workshop attendees. After our coffee sesh wrapped up, we were free to spend the rest of that day as we wished. I popped in to ABC Home around the corner to gawk at their housewares and eventually bumped into Christine Chitnis, another workshop attendee and cookbook author, so we had lunch together at ABC Kitchen! Fall fruits sourced from the Union Square Farmers Market. Apples, quince, and pears. The following day I made my way to the Sunday Suppers studio for the our two day food photography and styling workshop. After a light breakfast of granola, yogurt, and the most fragrant grapes - we settled in for introductions. There were fifteen of us in total attending the workshop and some weren't able to attend the previous days market tour, so it was nice to go around the table and share a little about ourselves. Afterward, Aran led us through some slides of her work. She discussed lighting, composition, and styling basics with us as we all took notes and asked questions when they popped up. After the presentation, we moved over to the kitchen to watch Aran in action. She made one of her famous gluten-free buckwheat apple galettes as well as a pear galette. You can find the recipe here! Aran preparing to roast a kabocha squash with sumac, za'atar, and herbs. 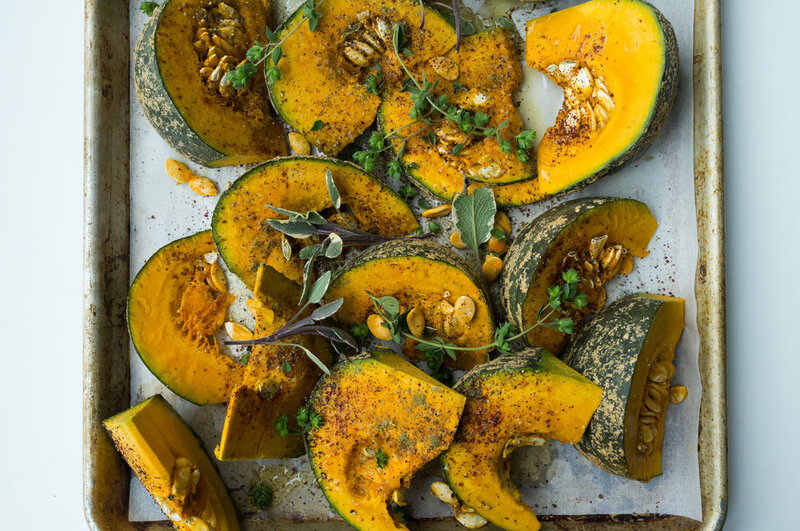 Roasted Kabocha with sumac, za'atar, and fresh herbs. One of the perks of this workshop was the meals prepared by the Sunday Suppers team. Lara Southern and team cooked the most beautiful meals for us both days. Breakfast and lunch were such a treat! In fact, I did my best to recreate both of the soups as soon as I got back to Boston. Cauliflower soup with a brown butter drizzle. After our meal we spent the rest of the day watching Aran behind the camera as she walked us through her styling process. Being a visual learner myself, I really enjoyed watching her work. Aran working with an attendee. The highlight of day 2 was meeting with Aran one-on-one to go over anything we wanted. It was kind of like office hours and to be honest, I was nervous. I wanted to get the most out of my 10 minutes with her but I was also pretty exhausted after the first full day. I decided to use my time to ask her about a few specific photography concepts that I hadn't quite grasped. I also showed her this website and some of my Instagram posts too. It was super valuable to have this one-on-one time with her after a couple of days of intense learning! All in all I was so happy to have taken this workshop. I came home thoroughly inspired to cook, bake, shoot, and style food. I still have no clue where these skills will take me exactly, but I'm definitely enjoying the journey.